Sunderland stuttered to their seventh defeat of the season as they were demolished 4-0 by Swansea. The defeat meant that they are still the only the only Premier League side without a victory this season, a fact that new manager, Gus Poyet was unable to change on his managerial debut in the top-tier of English football. The Black Cats are in severe trouble at the bottom of the Premier League; currently, they are on course to have a worse year than the embarrassing 2005-06 season when Sunderland finished bottom of the division with a meagre 15 points. The resounding 4-0 defeat by Swansea only furthered the belief of most football fans that we will next see Sunderland in the Championship; this season already looks as though it can be filed under football’s sizeable ‘lost causes’ folder. 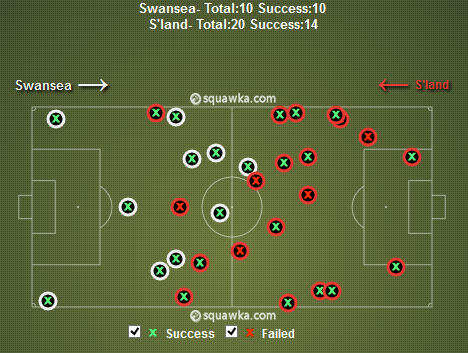 Poyet’s side’s inability to consistently win their tackles was pivotal in their meek showing against Swansea. Whilst the home side won every single one of their challenges, Sunderland’s success rate in this area was a weak 70%; the basic ability to win the ball from their opponents eluded the Black Cats. 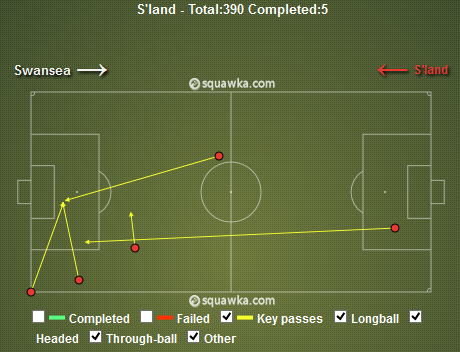 This starved them of the ball for much of the game and made it very difficult to find a route to some points. Sunderland’s reluctance to pressure a Swansea side known to enjoy time on the ball also contributed to their disembowelment yesterday; it allowed the home team to become comfortable and attack virtually at will. The high percentage of passes which Swansea completed (86%) proves this, and Poyet must learn quickly that he cannot afford teams the amount of space which his deep defence did yesterday. 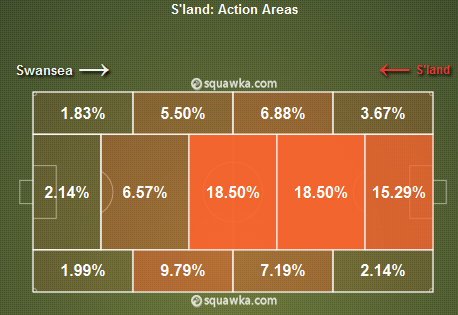 This misery in defence was compounded by Sunderland’s complete inability to create anything in attack. As the graphic below demonstrates, their passing was blunt and unable to slice through Swansea’s defence; there was barely any attempt to unleash Steven Fletcher. Sunderland seemed to become dispirited every time they entered an attacking possession and this severely limited the impact they were able to have on the game. 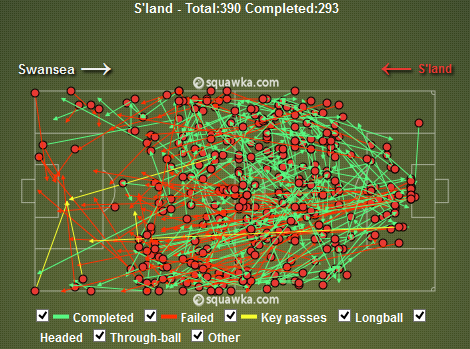 Furthermore, if we look at Sunderland’s key passes (again below), we can see that the Black Cats failed to create any chances within the Swansea box, and they created chances through long balls, suggesting they struggled to gain a foothold in the Swans half. 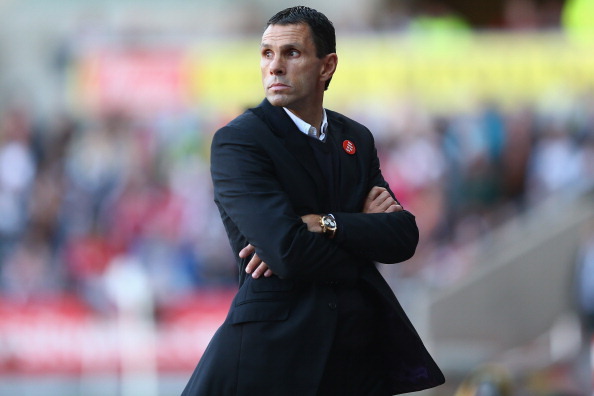 There were a variety of factors which all contributed to the Poyet’s poor inaugural game as Sunderland manager; it is unlikely that the Uruguayan will struggle to find something to work on in training this week. If these problems are not righted, the long beginning to Sunderland’s season could be elongated for the whole 38 games of 2013-14.